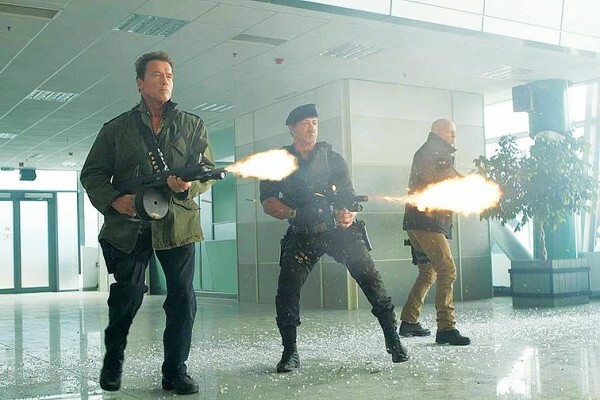 If there’s one thing The Expendables 2 is really good at—and there is pretty much just this one thing—it’s demonstrating that 2010’s The Expendables was a one-joke wonder that had more than fulfilled its potential before that first movie had even finished unspooling. This dumb movie wants you to find it absolutely hilarious that random ’80s action heroes—now puffy with age and sporting embarrassingly bad dye jobs—pop up in deus ex actioner situations, trade quippy and dated one-liners with one another and then disappear again. Generally, the less awesome and more cheesy an ’80s action hero is, the more screen time he gets here. So prepare for a lot of Dolph Lundgren, and not so much of Arnold Schwarzenegger or Bruce Willis. This time out, a girl crashes this He-Man Woman-Haters Club—in the form of Maggie (Nan Yu), because Awesome Chinese Badass Chick!—as they head out to scenic Albania on a new mission, which is interrupted by Euro baddie Jean-Claude Van Damme. His character is called “Jean Vilain,” which translates exactly as you think it does. There’s a level of brutal, boring stupidity here that makes The A-Team look like it was written by Sun Tzu. It’s all a big joke. Except it isn’t in the least bit funny.